There was a wave of positive energy for the arts in Ajijic either side of the 1968 Mexico City Olympics and its related cultural activities in Mexico City and Guadalajara. Perhaps the largest single art fair held in Ajijic during these years was the Fiesta de Arte held at Calle 16 de Septiembre #33, the home and garden of art patrons Frances and Ned Windham. 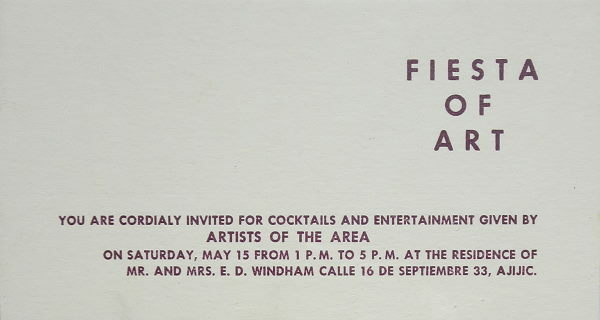 The Fiesta de Arte was held on Saturday 15 May 1971. Planning for the show, originally called the “First Lakeside Artists Fair” was well underway by April. The organizers were John K. Peterson and Peter Huf, who enlisted the help of Beth Avery, Donald Hogan (who as murdered a few months later) and several other artists. They expected about 20 artists to take part. A week before the show, the advance publicity in the Guadalajara Reporter named 29 artists whose work – paintings, photography, block prints, serigraphs and sculptures – would be on show and said that more than 500 people were expected to attend the one-day event. Reports after the Fair show that the projected numbers were surpassed. While almost all the exhibitors were foreign artists, there was one especially interesting local artist: Fernando García, a self-taught carver. García was an employee of Robert de Boton, husband of internationally-acclaimed painter Alice de Boton. When French-born Robert retired from biochemistry, the couple moved to Mexico where Robert began to dabble in carving and sculpture. When García expressed an interest in carving, Robert encouraged him to see what he could do. García worked by candlelight late into the night for several weeks and completed several “small primitives of extraordinary beauty and sensitivity”, all of which sold instantly. The list of exhibitors at the Fiesta del Art included Daphne Aluta; Mario Aluta; Beth Avary; Charles Blodgett; Antonio Cárdenas; Alan Davoll; Alice de Boton; Robert de Boton; Tom Faloon; John Frost; Fernando García; Dorothy Goldner; Burt Hawley; Peter Huf; Eunice Hunt; Lona Isoard; Michael Heinichen; John Maybra Kilpatrick; Gail Michel; Bert Miller; Robert Neathery; John K. Peterson; Stuart Phillips; Hudson Rose; Mary Rose; Jesús Santana; Walt Shou; Frances Showalter; Sloane; Eleanor Smart; Robert Snodgrass; and Agustín Velarde. Guadalajara Reporter: 3 April 1971; 24 April 1971; 8 May 1971; 22 May 1971; 5 June 1971.